Mosquitoes are a dangerous and ubiquitous insect. They can be found in nearly every area of the planet, from dense jungles to high peaks. Mosquitoes have four stages in their life cycle, three of which they must go through before reaching adulthood. The larval stage is a developmental process in the mosquito life cycle. This baby mosquito phase is essential for mosquito development, so it is crucial we understand it if we are to win the war against these disease-carrying pests. In this article, we take an in-depth look at mosquito larvae. Where Are the Larvae Usually Found? Mosquito larvae are the second stage in the mosquito life cycle. The female lays her eggs, either upon water or, if necessary, in a dry place which will be later submersed. The larvae are the resulting hatchlings. They are aquatic in nature, spending this entire stage of life in the water. Their lifespan as larvae is between four days and two weeks. This can vary depending upon variables such as the species of mosquito, and the water temperature. The larvae will spend most of their time at the surface. They use a breathing tube to pierce the surface of the water and take in air. This tube is called a siphon. Completely legless, mosquito larvae rely upon wriggling motions to move about. It is for this reason, they are sometimes referred to as ‘wrigglers’. If they become disturbed, they will seek shelter at lower depths before returning to the surface. They may spend a while in hiding, but they must eventually come back to the surface to breathe. Thus, mosquito larvae can be very vulnerable to predators. Mosquito larvae must feed continuously. A constant uptake of nutrition is essential to provide enough energy for their next transformation. Larvae use little brush-like mouthparts to direct particles into their mouths. They feed on micro bacteria, plankton and algae, although some types may eat other mosquito larvae. This larval stage can be effectively broken down into separate processes, which are separated by skin shedding. Mosquito larvae shed their skin four times during this stage of life. Each shedding is known as an ‘instar’. At the fourth instar, the larva becomes a pupa and will no longer be able to feed. Mosquito larvae reach lengths of up to half an inches, before becoming pupae. Although they are legless, their body shape resembles that of a caterpillar. Mosquito larvae can be recognized by their prominent position at the water surface. Their breathing siphon is situated at the rear of their long bodies. The siphon will pierce the water’s surface to enable them to breathe, much like a tiny snorkel. Siphons are easy to spot, as they are four times as long as the larva’s body width. The length of the siphon enables the larvae to suspend themselves by the rear, just under the surface. At the other end of their caterpillar-like bodies is an oval-shaped head. On close examination, you can see the head has feeding brushes and antennae. The bodies of mosquito larvae consist of nine separate segments. This segmentation assists their development and allows them the flexibility to swim and escape predators. Each segment also has dorsal brushes on both sides, which assist with feeding and movement in the water. The eighth segment contains the breathing siphon. Mosquito larvae are commonly confused with other aquatic larvae, such as tadpoles and leeches, due to their coloration and size. This is especially so during the early stages of their development. Like other larvae, they are often translucent, brown or cream colored, depending upon which growth phase they are at. All mosquito larvae are aquatic, therefore they are always found in still water. In some cases, however, certain species of mosquito will lay their eggs in dry areas. Even so, these eggs will then only develop into larvae once submerged in water. In natural settings, mosquito larvae can exist in a wide variety of wet places. Some species are adapted to saltwater and thrive in sea-marshes. Whereas, other types of mosquito only lay their eggs in freshwater sites. Such locations may include lakes, areas bordering rivers and streams, or any area where rainwater collects. In developed areas, mosquito larvae can survive in many different places, such as in ornamental ponds and puddles. Garden pots, pets’ dishes, irrigation systems and ditches are also popular sites. Essentially, anywhere water can collect is capable of sustaining mosquito larvae. Plastic toys, tubs and trays left outdoors provide ideal housing for mosquito eggs once filled with rainwater. Some mosquito types prefer to lay their eggs in tree hollows and other vegetation that gathers water. These may play host for larvae both near human habitation areas and out in the countryside. Mosquito larvae can develop in a wide variety of places, therefore, by far the best method of protection, is prevention. Of course, it is not possible to suppress natural mosquito breeding sites. However, on an individual level, many small man-made sites can be contained. Removing rainwater from garden items before it starts to stagnate is essential. Tarpaulins, bird baths and plant pots should be checked and emptied on a regular basis. Saucers under garden pots can also provide ideal conditions for mosquito larvae. Another prevention method for mosquito larvae development, is to evaluate what you keep outside. Decide carefully how you can cover garden items to avoid rainwater collecting. Ensure gutters are kept clean and free-flowing. Decluttering and disposal of any unused or unwanted outdoor items will also be beneficial. Although prevention is the best solution, it is not always practical, nor possible. Luckily, getting rid of mosquitoes while they are in the larvae stage, is still an effective way of reducing mosquito numbers. It is also much easier than dealing with an adult mosquito infestation later. If you have a pond in your garden, you may be wondering how you can get rid of mosquito larvae without damaging other insects and wildlife. Placing chemicals in your pond is not recommended. Such chemicals are very toxic, not only on any fish, but also birds and even pets. Cats can be at a greater risk of chemical exposure via drinking the water or hunting insects and animals. A natural and all-round better way to get rid of mosquito larvae is to aerate your pond. This will improve the water quality and disrupt mosquito larvae development. Adding a stream, pumps, cascade or fountain will all enhance the look of your pond, while maximizing water flow. As mosquito larvae need stagnant, still water for their nutrition and development, your pond improvements will prevent them invading. Furthermore, it is good practice to remove as much floating matter and vegetation from the pond, to eradicate possible shelter for larvae. If that sounds like too much hard work, you could also try to make your garden more accessible to mosquito larvae predators. Of course, if you’re right in the middle of the city surrounded by roads, or are meticulous about your flower beds, this will not be an option for you. However, there are still ways you can try to boost the number of larvae predators. For example, there are plenty of species of fish which thrive on mosquito larvae. A quick search online or trip to your local pet center will help you to find a species that is ideal for your location, pond, and level of upkeep. 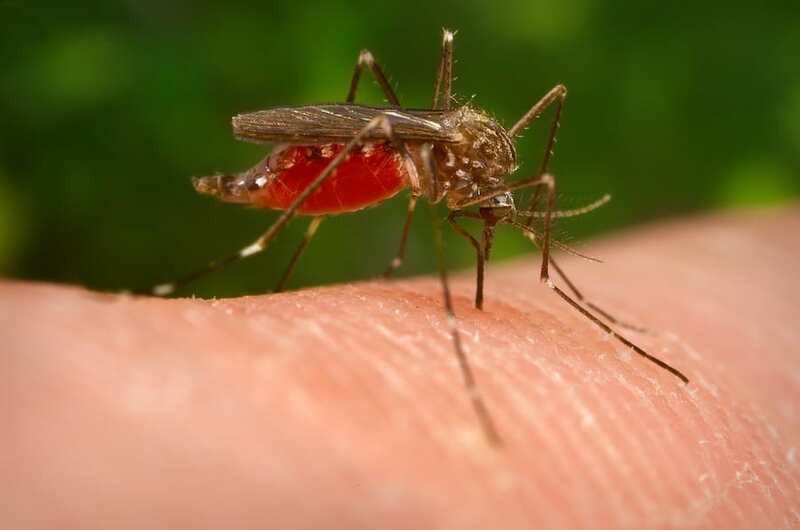 Aside from encouraging natural predators, clearing up and increasing water flow, there is another way to destroy mosquito larvae by using a natural resource. BTI mosquito dumps are environmentally-friendly and non-toxic to wildlife, including pets, birds and fish. They are small, don’t cost much and they can also be used in other sources of standing water such as birdbaths and rainwater collection barrels. BTI is a type of bacteria (Bacillus Thuringiensis Israelensis) that is toxic to larvae. It is approved by the United States EPA. Fast, efficient and effective, it is an effortless way to get rid of mosquito larvae. BTI is undoubtedly an improvement on the use of chemical pesticides. It is, however, toxic to insects and it will have a knock-on effect on animals that rely upon those insects for food. As a last resort, there are many chemical options available. These, however, will often not be suitable for households with pets, children or for use by pregnant women. In addition, such products may kill wildlife and plant life. You will also need to check for potential runoff, to avoid contaminating a greater area with a potentially lethal product. Aside from chemical products aimed specially for use as pesticides, household products can also be used. Popular and effective products include bleach and cooking oil. Bleach has been recognized for its efficacy against mosquito larvae by the EPA. However, it is unsuitable for use in ponds, and should only be considered for use on items that are unlikely to come into contact with wildlife. Oil prevents insects from breathing as it creates a film on top of the water surface. This will effectively suffocate the mosquito larvae, as they are unable to break through to the air. However, it will also affect anything else living beneath the water, including fish, so it should be used with caution. Mosquito larvae are much easier to get rid of than fully-grown mosquitos. Attacking them when they are in this vulnerable stage will directly reduce the number of adult mosquitoes in the area later. Simple steps, such as removing containers which collect rainwater, can suffice. Should you need to go further than this, it is better to use natural treatments as opposed to pesticides. If this is not possible, then care should be taken to minimize the impact of these pesticides on the surrounding area and wildlife. By taking the above steps against baby mosquitoes now, you will save yourself much irritation and annoyance in the weeks to come.